The performer and comedian Steve-O had his first real brush with captive wild animals while he was attending Ringling Brothers and Barnum & Bailey Clown College, an odd place for a future animal activist to start out. But it gave him an inside look at the way people who keep animals for profit think. "When doing press to promote shows, the clowns get asked about their opinion on animal abuse in the circus," he told The Dodo. "It got really awkward when they'd ask. We were told by the publicity department, ‘You have no opinion! You shut up, and you stand down, you're a clown!'" A spokesperson for Ringling Brothers and Barnum & Bailey Circus denied this, saying, "We encourage people [performers] to talk about our animal care and what they see every day. We're very proud of our animal care." Later, when he began working as a clown in a different circus, he was told to stay away from the elephants, and he watched as the circus' only tiger was carted from a small cage to an even smaller box every night for a magic act. Still, Steve-O (also known as Stephen Glover) was told not to speak to the media about the animals, "not to even look at them," he said. "When I was working in circus, my sympathy for animals took on new sort of thing," he said. "Once I got a voice through the notoriety that came with [the TV show] ‘Jackass,' I would speak freely about how animals were abused in circuses." Now, he's building up a long list of animal causes to which he's lent his name. As a spokesperson for PETA, Steve-O campaigned against wearing fur for the organization's "I'd Rather Go Naked" project. He teamed up with Michelle Cho, Vice President of the Humane Society of the United States. He went vegan (though now he's quick to mention that he's introduced some wild-caught fish into his diet for health reasons), and was an outspoken campaigner against factory farming. Now, his latest campaign is probably his loudest. 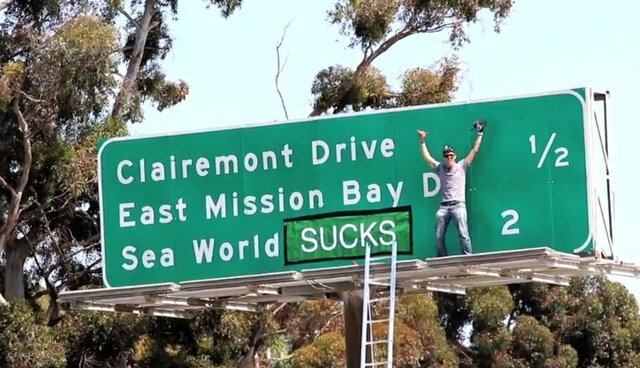 After watching the CNN documentary "Blackfish," he had the anti-SeaWorld campaign on his mind and, after passing "SeaWorld Drive" in San Diego, the inspiration for a perfect stunt struck him (see the video above). "I have a pretty passionate stance against animal cruelty, as everyone knows," he said. "But I want to be really clear here too: when I go on tour to various locations, one of first things I think of is what kinds of trouble can I get to to shake things up and get some news ... this worked out so great. I could kill two birds with one stone: bring attention to the cause I believe in, and bring attention to myself." Steve-O noted that he was very careful not to damage any property during the stunt. And the result is something of a circus itself. The whole ordeal (which took place last May) took five tries and cost him more than a few injuries, but Steve-O says it was worth it. "It's magical if I can take a wild and crazy stunt and do some good," he said. "Here I am setting out to entertain people and then I can do something to make a difference."